Presenting....our current project. This is our latest purchase and Kevin's new day job: Flip this House, the Sequel. This little beauty is a 1200 square-foot, 3 bed, 2-bath brick house on a great oversized lot. We learned from our last project that we only want brick houses so we're already way ahead of the game versus the previous go-round. It will need a new roof and some exterior repair, but the inside is pretty cosmetic and basically just lots of labor and materials. Wait... what else is there? Anyway, some of the before shots are a little scary. The plan is to bring you pictures each week of the progress we've made. We are missing a camera charger now so week two may be strictly iPhone pics. 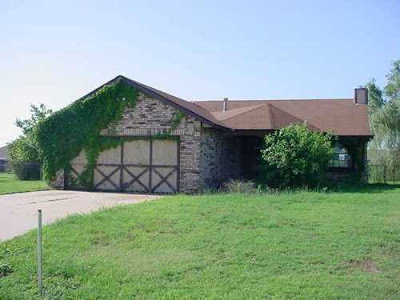 The exterior: Complete with overgrown landscaping and missing mailbox. The garage has been coverted to a big room, but we'll be changing it back. The lovely living room. There was an extremely heavy wood-burning stove on a brick hearth. Sold the stove on Craigslist and plan on busting out the brick and using drywall in its place. The kitchen: Not in horrible shape. It will get painted cabinets, granite counters, new appliances, and tile floor. The laundry room. A cute space. More paint, tile, and some updated plumbing will make this good as new. Hall bath: Very cool that this house has two full baths. We'll rip everything out here and replace the tub, toilet, vanity top, mirror, light fixture. Paint and tile will complete the renovation. There are two beds in addition to the Master suite. This is the middle bedroom and the site of some teenager graffiti. New drywall was put up in this room so we'll mud/tape and texture it to match the rest of the house. Paint and carpet will be the standard here, as well as everywhere else. New light fixtures, hardware, and knobs will also go throughout. The Master: A GREAT size for the house. It's got a cool tray ceiling and an attached bath. Plus doors to the backyard, which we'll change from sliding to French. We had a little wallpaper party a couple of days before we closed. The kids couldn't help themselves! And again with the Master bath, it will get the same treatment as the hall bath. New counters, tub, tile, toilet, fixtures, etc. Super scary garage conversion. Obviously the carpet is coming up here, we'll replace the garage door, remove the air conditioning unit and two new exterior doors will go in. Paint and an opener will take this space back to its original purpose. And I think that pretty much wraps up our plans. Our timeline is about 6 weeks. A lofty, but hopefully reasonable goal. Piece of cake, right? Can't wait to see what you do to the house! I love those flip shows. When do we get to see inside pictures? Yes...when do we get to see the inside pictures!?! I want to send Andy over there all the time to get his motivation on...for our wall. i would love to flip houses! of course, with someone elses' checkbook! I'm so excited to see how you handle this project. I know it's going to look FABULOUS when you're through. When you're done there, please send Kevin over to my place...and um, your taste...send that too. Best of luck to you both...may you finish under budget and by deadline.